From Sunday 6 January 2019 until Tuesday 30 April 2019: Enjoy 15 % off! From Wednesday 16 January 2019 until Tuesday 30 April 2019: Enjoy 15 % off! From Saturday 19 January 2019 until Tuesday 30 April 2019: Enjoy 15 % off! From Friday 25 January 2019 until Tuesday 30 April 2019: Enjoy 15 % off! From Thursday 17 January 2019 until Tuesday 30 April 2019: Enjoy 23 % off! From Wednesday 23 January 2019 until Tuesday 30 April 2019: Enjoy 23 % off! From Monday 11 February 2019 until Friday 31 May 2019: Enjoy 15 % off! From Thursday 14 February 2019 until Friday 31 May 2019: Enjoy 15 % off! From Sunday 17 February 2019 until Friday 31 May 2019: Enjoy 15 % off! From Friday 22 February 2019 until Friday 31 May 2019: Enjoy 15 % off! From Wednesday 10 April 2019 until Monday 6 May 2019: Enjoy 25 % off! From Wednesday 13 February 2019 until Friday 31 May 2019: Enjoy 23 % off! 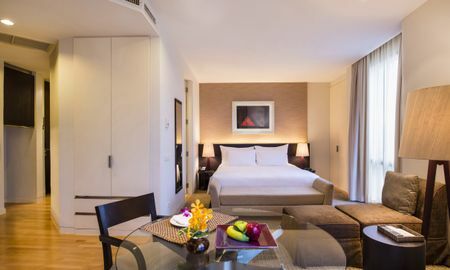 From Monday 4 March 2019 until Friday 3 May 2019: Enjoy 28 % off! From Saturday 9 March 2019 until Sunday 30 June 2019: Enjoy 15 % off! From Friday 15 March 2019 until Sunday 30 June 2019: Enjoy 15 % off! From Saturday 23 March 2019 until Sunday 30 June 2019: Enjoy 15 % off! From Thursday 28 March 2019 until Sunday 30 June 2019: Enjoy 15 % off! From Sunday 3 March 2019 until Sunday 30 June 2019: Enjoy 13 % off! From Wednesday 13 March 2019 until Friday 31 May 2019: Enjoy 25 % off! From Tuesday 24 July 2018 until Saturday 31 October 2020: Enjoy 10 % off! From Wednesday 27 March 2019 until Wednesday 8 May 2019: Enjoy 15 % off! From Thursday 4 April 2019 until Wednesday 31 July 2019: Enjoy 17 % off! From Friday 12 April 2019 until Wednesday 31 July 2019: Enjoy 17 % off! From Friday 19 April 2019 until Wednesday 31 July 2019: Enjoy 17 % off! From Thursday 25 April 2019 until Wednesday 31 July 2019: Enjoy 17 % off! From Monday 8 April 2019 until Saturday 15 June 2019: Enjoy 20 % off! From Saturday 1 June 2019 until Saturday 31 August 2019: Enjoy 20 % off! From Tuesday 24 July 2018 until Friday 1 November 2019: Enjoy 13 % off! From Sunday 6 January 2019 until Tuesday 30 April 2019: Enjoy 19 % off! From Tuesday 8 January 2019 until Tuesday 30 April 2019: Enjoy 19 % off! From Tuesday 29 January 2019 until Tuesday 30 April 2019: Enjoy 19 % off! From Monday 11 February 2019 until Friday 31 May 2019: Enjoy 19 % off! From Tuesday 26 February 2019 until Friday 31 May 2019: Enjoy 19 % off! From Tuesday 5 March 2019 until Sunday 30 June 2019: Enjoy 19 % off! From Tuesday 19 March 2019 until Sunday 30 June 2019: Enjoy 19 % off! From Sunday 31 March 2019 until Sunday 30 June 2019: Enjoy 19 % off! From Tuesday 24 July 2018 until Saturday 31 October 2020: Enjoy 9 % off! From Friday 1 November 2019 until Saturday 31 October 2020: Enjoy 13 % off! From Thursday 4 April 2019 until Wednesday 31 July 2019: Enjoy 16 % off! From Friday 12 April 2019 until Wednesday 31 July 2019: Enjoy 16 % off! From Tuesday 16 April 2019 until Wednesday 31 July 2019: Enjoy 19 % off! From Friday 19 April 2019 until Wednesday 31 July 2019: Enjoy 16 % off! From Thursday 25 April 2019 until Wednesday 31 July 2019: Enjoy 16 % off! From Tuesday 30 April 2019 until Wednesday 31 July 2019: Enjoy 19 % off! From Tuesday 24 July 2018 until Saturday 31 October 2020: Enjoy 18 % off! 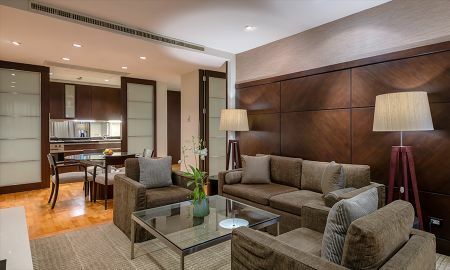 The marriage of convenience and unparalleled location meet at the stunning Emporium Suites by Chatrium. 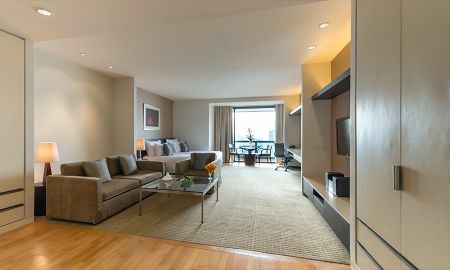 A prestigious and wholly excellent combination of 5 star serviced apartments with the luxury of vast space and the privilege of top-notch service, the accommodation totals 376 smart suites in one, two, and three bedroom stylings, all with floor to ceiling windows which take full advantage of gleaming natural light. 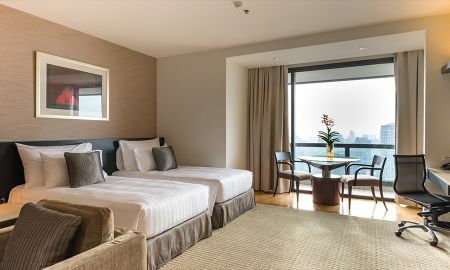 The suites are the only residence in Bangkok to offer Terrace Suites which cover 330 sq m and Penthouses perched on the 42nd floor. 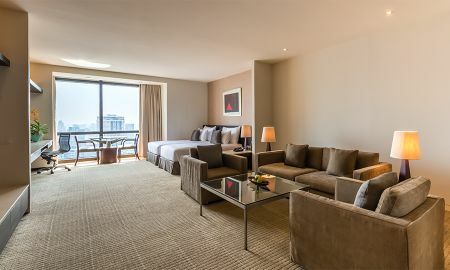 Panoramic city views greet each guest with the finest ensuite bathrooms and fitted kitchens available. 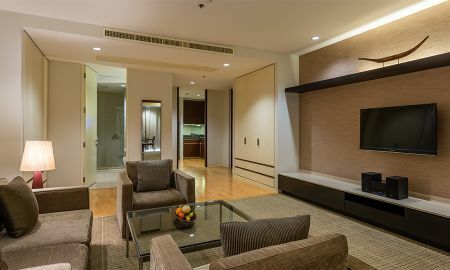 Ranked within the highest tier of hotels in Bangkok, the 5 star luxury serviced apartments at the Emporium Suites by Chatrium ensure the cool, breezy, stress free setting, with the premium service you deserve, fulfilling business and leisure travelers’ every need for a stay unmatched in ultimate luxury. 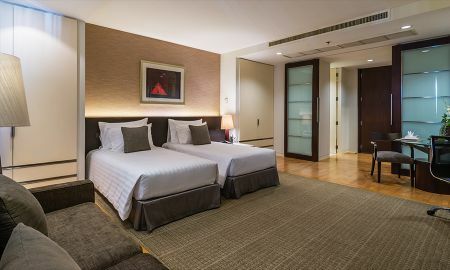 Situated in the center of Sukhumvit Road, Bangkok’s main business districts and only 45 minutes from Suvamabhumi International Airport, the hotel provides ideal access to the city’s main attraction, including the Emporium Shopping Complex (one the most visited and exclusive market destinations), as well as premium offices, dining and entertainment. 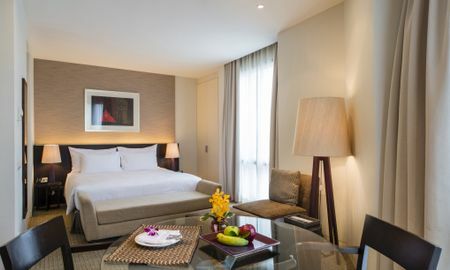 Adjacent lies the luxurious oasis of Benjasiri Park, for traveler’s relax from a day of stressful traveling. Covered access to the BTS Skytrain is also available, providing the quickest and most convenient means of transportation around the city. Extra benefit: 20% discount at THANN Spa on all a la carte menus.